:With more than 80,000 copies sold, You're Already Amazing is clearly resonating with the hearts of women. Now Holley Gerth fans have the opportunity to go deeper into the book and into their own hearts with the You're Already Amazing LifeGrowth Guide. With Holley's trademark enthusiasm, thought-provoking questions, and interactive tools, this workbook helps women understand their unique identity a child of God. More importantly, it shows women how that identity then changes practical aspects of their lives, such as how they interact with their husbands, children, and friends; how they pursue their careers and personal dreams; and how they order their everyday lives. Perfect for either small group use or individual study, the workbook includes excerpts from You're Already Amazing, personal application guidance, discussion questions, prompts for journaling, and creative activities for women to do on their own or as a group. It is also supported with online tools Holley has developed to keep women moving in the direction of their dreams. 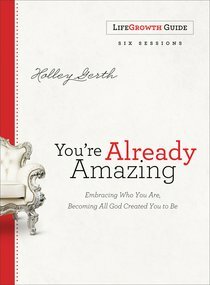 About "You're Already Amazing: Embracing Who You Are, Becoming All God Created You to Be (Lifegrowth Guide)"
Holley Gerth is an award-winning author, speaker, counselor, and cofounder of (in)courage- an online home for the hearts of women that received over a million page views in its first year. Holley encourages thousands of readers through her highly popular blog Heart to Heart with Holley, more than 2000 greeting cards written for DaySpring, and in her popular first devotional Rain on Me. She invites women to meet her at www.HolleyGerth.com.